Erica Bunker | DIY Style! The Art of Cultivating a Stylish Wardrobe: What I'm Wearing: Easing into Fall with Black & Cobalt! 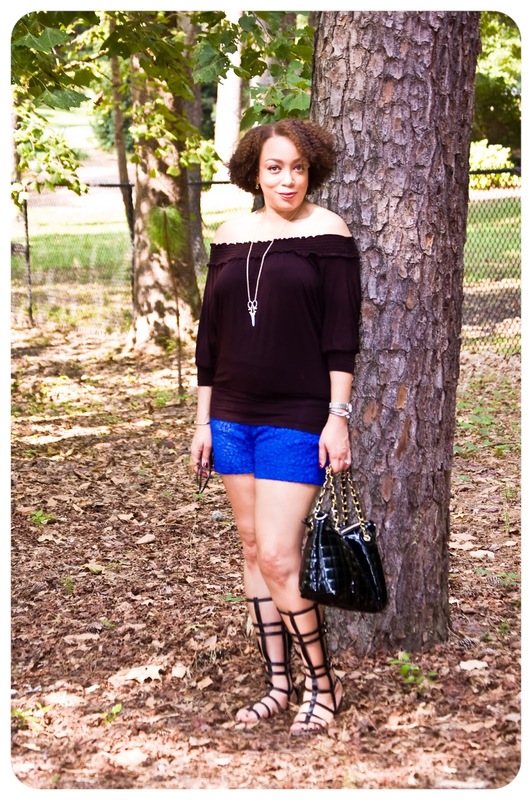 What I'm Wearing: Easing into Fall with Black & Cobalt! Happy Monday! I've been a little lazy about sharing with you guys what I wear daily. Well, that is the days that I decide to surface from my sewing room and put on something other than a pair of athletic shorts and a tank. And since school is back in session, my desire to get dressed rarely matches with family photographers' schedule. I tend to run errands early in the day and by 4 pm, I'm back in my "play clothes". So for yesterday, I wore this to hangout with my husband. Even though the temps were pushing 90 degrees, I'm mentally willing fall to come. And something about this September is drawing me to darker hues. I can't even tell you how much black fabric I've purchased in the last couple of weeks. I need to initiate a self-imposed moratorium! Fun to sew, fun to have, sure, but wear it when….?" Pretty condescending, eh? Look, here is the deal: I recently wrote this post about loving the things that I make and all of the time and effort put into sewing a garment. And remember this post about how a lot American women stopped giving a damn and stopped putting any effort into dressing? It sparked a lot of great discussion. 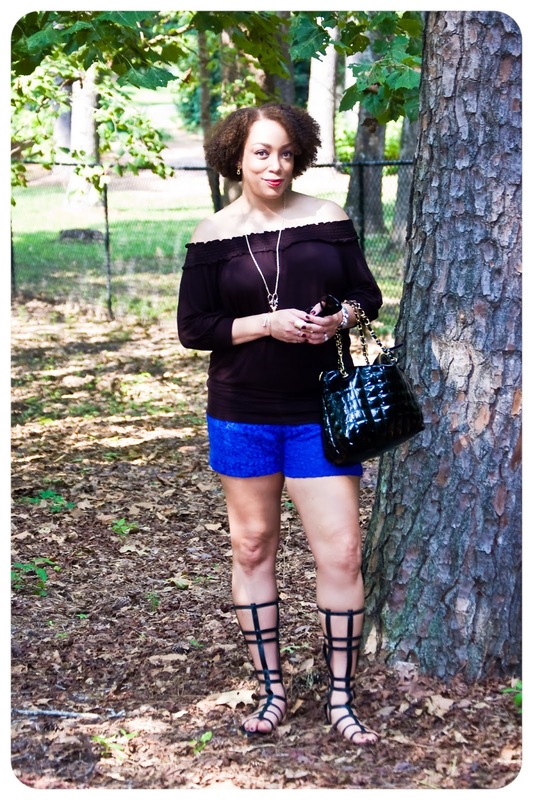 Wearing: Top (old); shorts - Vogue 8865; Asos.com Gladiator Sandals. Erika! Great post -- and I love shorts. I'm originally from Florida (live in LA) and have so many shorts I have to store them at different times. I concur with your analysis we Americans need to dress better - I love flying Virgin because I perceive the men dress better (they all have leather shoes!). And, it is slightly close-minded to think that clothes can't inspire us (they do me!) to do things and attend events that may not normally come to mind. I mean, come on, you do live (I think) in B'ham -- and there is tons going on. I'm on my way to Mood this afternoon! Thanks for the thoughtful post! There is Pam! And I guess some folks tend to forget I do have an adoring husband that loves to take me out and parade me around! Thanks! Another Great outfit on you. You give so much inspiration to those of us who "used to sew" yet we still cannot dust off the ole Singer. You are so right! Don't focus on the negative comments people say. My great grandmother used to say, "you can't please everyone all the time, so just please yourself." The clothes you make are fabulous and you dictate where and when you want to wear them. You look simply amazing and keep doing what you do, you fans love it. Oh and by the way, I saw The Coalition on Netflix and you did an amazing job with the clothes. Thanks for sharing all that you do, some of us really do appreciate all your hard work. Thank you! I'm sure Monica would love to know that you enjoyed her movie! I'm in two minds about commenting here, but will for the sake of debate. I thought much the same thing as your commenter wrote when I first saw that pattern advertised (not your version, I hasten to add). So whilst I think your white dress is 100% great, I'm inclined to agree that I wouldn't know where to wear it (hence why I've never bought the pattern, although liking the style). That being said, I might have voiced my opinion in a different way if I had decided to make an actual comment along those lines. Maybe it was a comment made on the spur of the moment without thinking how it might be misconstrued? Like it's saying, "man, awesome to have a situation to wear this", sometimes being able to apply a design to our lives is a skill in itself...so perhaps the offending comment was actually a back-handed compliment?! ;-) Whatever the case, you like it, the dress looks awesome and that's all that matters. phew! Longest comment ever. If YOU don't have an occasion or place to wear a machine-washable, cotton maxi dress, then that's okay for YOU to voice. I wouldn't deign to debate you about YOUR life. But when a person starts to question my wardrobe choices and where I'm going in a doubtful manner -- that's called "GETTING OUT OF YOUR LANE". Wowzers, sorry if I upset you. I surely didn't mean to, in fact I meant the exact opposite (i.e. to try and find a positive from the original comment). I guess that backfired. My apologies. Sigh... I know tone gets lost in the written word. Nobody is upset. I'm sure you're a really lovely, optimistic person that tries to find the good in every situation. But noting is misconstrued in the statement that person made. It was straightforward. And I've been blogging for 8 years. I recognize a bitchy, shady comment made by some miserable house frau that's given up on life when I read it. Love the look. You look great. Werq. On your "questionable garment post"......wow. I don't understand why some folks can't let others lead the life that they represent best. If you are a sweats and t-shirt kinda gal....why be degrading to the gal that loves to rock stilettos and pearls. Just do you!!! I mean come on. Be bold. Be Fabulous. Be You! Thank you fabulous lady that doesn't need an occasion to be fabulous! **SIGH** Oh well...I feel so sorry for the person who has such a limited life that there would NEVER be an occasion to wear a gorgeous maxi. And you even made a point of saying that you put a belt on so that you could wear flats. Which means you can also wear it with heel for an evening out. folks need to expand their horizons. To the best of my knowledge, we only get one life, might as well look good and have fun! I believe if you have/make/find the outfit, the occasion will come. In fact, if I don't have something fabulous in my closet (that currently fits just right) I start to get nervous. I hope your white dress gets invited to Greece, or something equally terrific! There are some women that are so bothered by other women putting in that extra effort. It makes them feel some kind of way about themselves. When I see a woman "Doing it! ", it inspires me to get up and do it too! I'm with you. I want fall to be here and be here NOW! It's been in the 100's here and I am not only eager for cooler weather but for cooler weather clothes, too. I just bought a BUNCH of heavy knits (all black/dark brown/taupe) and I want to sew them, but more importantly wear them, which I can't in this hot weather. Here's wishing for the cool of autumn and fabulous sewing! Sewforward, I can't wait! I've been buying nothing but wool crepes, tweeds and leather! I'm so stoked for the new season! If I looked as good as you do in that dress, I'd probably wear it everywhere! I get comments all the time about how I'm too well-groomed. I think I'm a reproach to the slobs--they'd rather try to bring me down than to go to ANY effort to clean themselves up. I especially appreciate you as a woman of a certain age who hasn't given up, like so many do. You're a great role model showing people that you don't have to be 20 and stick-thin to look wonderful! How funny, I would not expect a maxi dress to inspire that reaction and I am not so fashionable. I saw that dress and marked it for the future since it's already cold up here! I'm a Southern girl transplanted up North and I am always astonished that fall starts so early here!! I've actually taken to dressing up when I'm working from home. It makes me happy to look nice 'just for myself' and I think that mood translates to the rest of my life too. By the way, I really appreciate it when you write about your thought process on choosing the types of fabric and bra information. It's helpful to a newbie seamstress like me. Ms. Green, I agree. Looking nice can do wonders for one's mood! Thanks! agree. I love clothing and because I do sewing helps me to be able to wear whatever I want whenever I want! Snide comments have always come out when I'm out and about..even from ladies at churches!!! Bored, envious and jealous people don't have a clue about their own style or self-worth. I missed your earlier posts but went back to read...much truth in both. Americans have become numb to dressing themselves which may be the cause of some younger girls dressing inappropriately if they have anything on at all!!! Keep doing you and I promise I will keep sewing and doing me way past these 58 years off mine! ALL your garments are lovely and fit you well, keep wearing them Mrs. Bunker!¡! BTW congrats on the featured photo in Redbook! Brenda, you nailed it! If you can sew anything you want, why in the world would you set restrictions and limitations?! Thanks! Whatever, Erica, I love the way you dress. You always are so polished and pulled together, and the stuff you make is amazing. Bonus for you (and the rest of us lurking the pictures!) that you don't restrict the fancier stuff for fancier occasions - if you want to wear something pretty, that's occasion enough. I wish fall would hurry up here, but as someone who is also in the south... maybe it'll cool off in November :P haha! I'm trying to find the middle ground here by sewing things in fall colorways, but warm-weather appropriate fabrics. Really dying to dive into my wool stash, though! Lladybird, you know how our weather is in the deep south. One day it'll be 90 and the temp will suddenly drop to 40 within a 24 hour period! Hello Fall! LOL Thanks! I totally love this look! I obsess about those amazing gladiator sandals. They've got all the attitude of boots! Thanks Laura! And according to the pictures from Spring 2014 fashion week, they're going to be around next year too! I love my clothes and cheers to you! Keep posting that stuff. Alot of us have things to do and places to go! How dare they upset my option for learning and inspiration! LOL! These women kill me. I have my non-sewing friends laughing at how catty sewing ladies can be. LOL Thanks Carol! The "no-style" people who make comments about your clothing are most probably those who everyday pull on their track pants and tee and think they look great, that is their "uniform" does not matter whether it is a day at home, in the kitchen or out shopping. Thanks Lesley. People can say what they want, but I haven't lived almost 43 years being anybody's fool. I know good and well when people make comments like that, it's coming from a place where self-worth does not live. Don't be sitting at home on your couch feeling some kind of way about yourself and taking it out on me. If they're reading the post about that dress, then apparently they have some sort of interest in sewing and fashion. They need to be devoting that energy to making themselves something nice. I think the white dress is lovely, but I also think the comment (Fun to sew, fun to have, sure, but wear it when….?) is pretty innocuous. I think offence was taken when none was intended .. just to preempting, it wasn't me that said it. I think maybe a follow up on where you may have worn it or that is an easy wear, easy care dress suitable for all occasions could have been helpful. Maybe the person just couldn't see where it would be suitable, maybe they live in a small town and it would be too wow for that town. Who knows. I don't read it as any attack on you or your style or that they need to be attacked for being a track pants wearing lowlife who has no style - I think that's a bit unfair. That's just how I read it. And no one is attacking anyone if they want to wear track pants. And "lowlife" that flowed so freely from you is apparently how you judge them. Wear your sweats and t-shirts and I'll wear what I like! And we'll all be happy. Don't know what happened there. I wasn't thinking you owed anything to anyone. And I don't judge anyone by what they wear or don't wear - I didn't make original comments about track pant wearers. I just think the comment wasn't meant to be offensive. Oh, and I don't do social networking of any sort except blogging. I love the dress and hope to get time to make a similar one this summer - life is occasion enough for me to wear my nice things. Love your style! You inspire me!!! That's a great sentiment. Thanks Dorie! Erica, you dress so beautifully. I love coming to your blog for ideas, and I hope that one day I the clothes I sew can be as well-made and stylish as yours. If what you wear suits your life and makes you feel lovely, then carry on. Exactly! If you stay ready, you don't have to get ready! Thanks blogofalltrades! You called that correct. I wonder how they'd appreciate me coming to their blog asking why they never sew nicer clothes and why don't they ever go anywhere to where something better than what they're sewing. Thanks MsKRS! I'm still trying to get over the fact that someone actually wrote that to you?! Obviously if you sew it, you wear it. I don't know too many people who take the time to sew their garments and not wear them? Carolyn, the funny thing is I don't even blog daily. So I think I could manage to get dressed and find somewhere to go at least once a week! If I wanted to front, I'd sew evening gowns! Wouldn't those pictures make my blog fancy? LOL. The white dress, is one that you could dress up or down, " called versatile" its kool to sew those. Me personally i wear whatever the f*** i want to wear long as I like it. No standards here. PS. I don't wear pants, jeans, or shorts only dresses and skirts so I really adore the dress. I know, right! I was wearing flat sandals for goodness sake! LOL. I can't wait to have a real occasion to look fancy. I'll show them how I really do it! Thanks Melissa! Erica, I'm counting on you wearing what you make, and not just for the photo shoot. I love it when you've made a piece and say you wear it often. It inspires me and reminds me...of my mom and aunt who were ALWAYS photo ready, even going to the grocery store, of EVERY Thursday night without fail, Mommy gave herself a manicure and pedicure. I NEVER saw her without manicured hands and feet, yet she raised three kids and always kept our house immaculate, even scrubbing her kitchen floors on her hands and knees...Your blog reminds me that I come from a long line of sewists that made their time behind the sewing machine count and were always perfectly turned out. In these days of everyone wearing the same drab, faded, rough dried clothes straight from the dryer, throwing on the same North Face fleece and calling themselves dressed up, I would be offended if you went to the fabric store, picked out a Vogue pattern and fabric, and you ended up sewing something you could get from Walmart. That would be a waste of your time...and mine. Those are my thoughts too. I can make anything I want to wear. Why limit myself?! Thanks Donne'! If Naomi can wear gowns for her community service, surely you can wear your maxi wherever you want to. I think that comment reeked of someone who dresses down daily and just thinks you're too fancy. People can try to make it sound better or innocuous all they want. I'm glad you are like the rest of us at home - ordinary style!! I put a lot of that on my blog, doesn't make for such inspired photos! Isn't it funny how one thinks ahead - we are entering summer here, but I'm already thinking about the following winter. And you do have to plan and sew ahead. I'm currently working on a wool and leather combo dress. It should be on the blog by the end of the week! Thanks SarahLizSewStyle! I remember reading that post and thought the person was being a little nasty...but what do I know. Your blog is one of the first ones I started following and I think your sewing is impeccable and that it why I keep reading. I just turned 57 years old on yesterday and am learning that people use blogs and other social avenues to let off steam because they just don't feel that good about themselves....Keep doing you Erica...you have many followers who love your stye and are inspired by it. All of the barbs going back and forth on this are somewhat sad to me - "bored", "low life" "jealous", "slob" and so on - from both sides. Its unfortunate that we are going back to the playground to get our points across. I remember seeing this dress when it was posted and thinking it was nice, but if I ever made it I'd have to change colors, as I'd dirty up white in a second. Your blog and Mimi's do always encourage me to expand my palette and try new styles, but white and I just can't get it right! Erica, were you able to tell from the post if this commenter frequently visits the blog? I ask because that dress seemed well within your style and not out of the ordinary for you. I wonder if someone who frequently saw your posts would question that, as they'd have seen you out and about in your fashions over time. I wonder if they had seen enough posts to reach that same conclusion. I'm not trying to justify those comments at all. But I would ask those who have called this person a slob, a lowlife, bored, etc took even a second to think of where they might be coming from. Again it is hard to know without seeing the whole post from the original commenter, but could it also be that they just don't know "better"? And if you don't know better you can't do better. I think more of someone in What Not to Wear or How Do I Look, that for whatever reason hasn't delved deeply into personal style for whatever reason and is maybe dipping their toe in the waters here. Ultimately none of us are responsible for helping this person get to the root of any of that (if that is even the case here), but these comments just read mean to me. Disagree, that's fine, but casting aspersions on the commenter, however well intentioned, may only stoke the flames. Blame it on the nerd in me - I can't help but grimace at ad hominem attacks! I totally understand where you coming from. See here's the difference: You kept your comment focused on you. You said you don't do white. But if you had put it back on me and started questioning why I'd want to wear a white dress or where in the world would I ever find an occasion to wear a white dress is where things would've went left. The comment was left on the Mood Sewing Network blog. And even over there, I have a year's worth of documented looks that anyone could easily get the gist of my personal style. And all comments are not innocuous. I've been blogging long enough and living long enough to catch shade when it's thrown. I, too, have a husband that will take me out and show me off. I also wear what I want and get sidelong glances at work or out and about for errands. I just decided, whatever, I'll dress how I like. Haters gon' hate! LOL Thanks Ladykatza! I don't know, I'm kind of wondering where you wore the dress as well. Mind you, I'm not wondering IF you actually wore it, just WHERE. The context of the shot isn't clear; the columns in the photo are so PERFECT for the dress that it does make me wonder if you just happened to be there while you were wearing it or if you went there to photograph it because it worked so well. That said, I'm sure you wore it somewhere and looked fantastic all the while. I really love your blog and I appreciate how much effort it takes to keep it up AND sew amazing clothing. Keep it up! And also, that location is called "The Temple of Sibyl" in Vestavia Hills, AL. It's about a mile from where we ate, so it was the perfect stop for pictures before dinner. And I'm still trying to figure out how a cotton dress got so much hype. I made a (what I thought was) gorgeous silk maxi dress with a high-low hemline that's fully lined and requires a trip to the dry cleaners. Nobody batted an eye at that one. But the one that can be tossed in the washer with a cup of Clorox and a scoop of Gain seems be getting all of the attention. You look nice. You always look nice. I wouldn't wear alot of the clothing you wear because I am pretty much a classic clothing person. I really do not enjoy pushing the envelope, so to speak :) People should dress to feel good about themselves, whatever that style might be. Thank you dkswife! I'm no advocate for dressing up everyday. I couldn't nor would I try to meet those standards myself. Right this moment, I'm braless in a tank top and running shorts -- sitting in my house! I'm in the sewing room working on my next garment and it's doubtful I'll do any kind of dressing up today! And this is me at least 3-4 days a week, unless I have a lot of things to do outside the home. People should just do them, be confident in their choices and leave everybody else alone! Hi 5! Go on being our living life role model. Some people just have to place their lacking into your life. To the dungeon with them! Real life includes tanks and athletic shorts but why can't dreamy Grecian dresses and leather and lace be a part of it too? You were my introduction into this blogging world (the first blog I EVER started following) and you will remain at the top not only because of what and how you wear what you make but the JOY you have in doing so. Keep doing what you're doing. I know you appreciate it (and so do we)! Lol.. sorry to be so nosy! I live in nyc, so I ride the subaways a lot and a white maxi would be a dirt magnet, but you were smart to make it a washable cotton. I say make all the fancy clothes you like and I'll keep watching in awe. Your blog comes closest to the types of patterns that I want to make so I look forward to every new garment post. Erica B, I love the way you dress. I love that you wear cool, interesting, modern, sophisticated outfits with a lot of care and attention to the styling (and as a long-time reader, I would say you have become ever more sophisticated and fashion forward over the years). I love that you do it and you don't live in NY or LA. Even more so that you make your clothes! That has been an inspiration to me, as well as a resource - I feel like you PR reviews are invaluable. I like to dress well myself - for me, generally dresses or skirts. And while I find that most people who comment seem to like the outfits I wear and the care I put into them, every one in a while someone can't seem to help making a snide comment, along the lines of the one sent to you. I always feel like those people are lacking in imagination - like they can't make the leap in their minds from wearing t-shirts and yoga pants (or whatever their uniform - not that there's anything wrong with it) to wanting anything else. Ignore them. PS - As a mom of two little children, I love the fact that the white dress is both sophisticated and washable! Let's put it all to rest!!!! Mrs. Bunker is Socialite, for those that don't Know! She is a Home State Ladyas well. My final take is that she blogs, shares her creativity with each of us. STOP visiting and throwing insults, innuendos (she lives the life like that)! Bothered? Stop looking. Intrigued? Ask questions BUT don't assume everyone lives in a bubble. Each of us live our lives whether we're comfortable with it or not! But this continual banter, which is delving, is totally unnessary! To hurl insults and later come back offering glimmers of comràdie is sheepish! Sorry, Mrs. Bunker. This is not my blog but enough of the foolishness! Keep doing you!!!!!!!!! I frequently think the same about many garment I see here and in various places and in magazines, fun to sew but where would I wear it etc. This is an observation I have about your blog Erica. I think this blog, because of the quality of photography and accessorizing, has crossed over from a personal fashion blog to an expert's blog. I'm sure you don't feel that was because these are your clothes and they are very personal to you and reflect your personal and private life. I recall someone asking you of a ring in a photograph was a real St Laurant (or something) which would be an intrusive personal question for sure. And your response was that she should do her own research. Fair enough response to an inappropriate personal question.....however, I would see you as an expert to go to for reseach. That is the delimma I see with your blog actually. Most blogs of this quality are not filled with personal wardrobe items nor are they written with your level of expertise. You straddle between expert and personal. I understand where you're coming from Lisa. I mean, how much more personal can you be? I actually sit down and make the majority of the things I wear. And my time is majorly fleeting. So if I'm sewing it, I wearing it. I'm just not that invested in blogging to entertain or amuse y'all like that! Some comments are not appropriate on a personal level, but they are comments an expert could expect and could probably answer in a helpful manner. On project runway, designers are frequently asked, where is your model going, and the designer is expected to answer. Not commenting on the context of the question, just that because of your skills I'd expected questions to be answered from an expert point of view. However, you may have a different view of the purpose of your blog. Your clothes do inspire me to get a life! Well Lisa, you might want to consider not assigning monikers to those that have not assigned them to themselves. It's a lovely compliment, but I have yet to hang out a shingle. My readers will be the first to know when I do! Well, I certainly won't ask inappropriate personal quesions about your personal garments, accessories or lifestyle. I just see you as someone who would have the answer to a ring's origins or suggestions as to what is approprite to wear somewhere. Being seen as an expert just happens to you sometimes whether you like it or not! Lisa, I've entertained questions regarding what type of undergarments I'm wearing. Sweetie, there is no question more invasive than that. I have a category dedicated to underpinnings just for that reason, LOL! Asking someone if their jewelry is real or fake is a pretty uncouth question where I'm from (and has nothing to do with sewing, the nature of this blog). And I find it interesting that you chose to retain that particular situation. Well, I retained it as I am quite good at sewing, selecting fabric and patterns, but lousey at accessorizing what I sew. You accessorize patterns I have sewn myself. That is why I pop by your blog, for inspiration on accessorizing mostly. I agree, it was not an appropriate question to ask someone personally. Glad you keep blogging and taking photos anyway. I have an envelope clutch now because of this site and love it! I chose to retain that exchange because it got me thinking about the position personal bloggers who have expertise are put in when asked questions that could be appropriate or inappropriate depending on if they are perceived or perceive themselves as experts or personal bloggers. Well since I'm not receiving any "expert pay", (experts receive compensation for their expertise and consultations) next time ask Google... that's the expert on everything. Or Pinterest. You learn a lot more when you do your own research instead of being spoonfeed. Just a thought. Enjoy the rest of your weekend Lisa! I agree Erica, if I like it enough to make it, you bet you will see me out about in it! I am definitely a woman who likes dressing up every chance she gets! That's why I like your blog too! As a person who lives in the tropics, I can think of a ton of places to wear a white cotton maxi - lunch with the girls, walks along the beach with family at dusk (the longer, the better - keeps the biting sandflies off my legs), strolls along the esplanade. Gosh, even joining my husband for a gin & tonic on the deck around the pool in the backyard. The first time I saw this, I thought it was a classic daytime to evening, casual to dressy kind of number for a gal like me living in the tropics. We do white (and bright colours) so well here!